Providing you the best range of microprocessor flame photometer s-935, digital flamephotometer s-931 and digital clinical flame photometer s-932 with effective & timely delivery. Are used for the determination of sodium, potassium, calcium and lithium. They uses the latest microcontroller technology and advanced engineering techniques so as to give enhanced and reproducibility. They have soft touch membrane key for ease of operations. 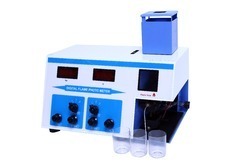 Digital Flame Photometer S-931 manufactured by us boast of top-notch quality. Supreme quality raw materials and properly updated technology is utilized for manufacturing them. Durability, longevity, strength, perfect designs are their highlights. Our top notch quality experts, R&;D team and engineers, are responsible for developing products, with the latest trend in sight. We manufacture Clinical Flame Photometer which are popular due to their excellent quality; utilization of fine quality raw material and top notch technology keep on fueling their craze. Our experts and engineers and supervisors have enough knowledge of the market to prepare properly updated and standard products. High durability, long existence, innumerable designs, standard market rates keep on increasing their demands.